I received a note in the mail recently. Addressed to me, obviously, but in my own handwriting. A strange sense of familiarity struck as I stared at it, trying to figure out when exactly I’d addressed it. In Boston? In San Francisco? Maybe it was a mistake, a card I’d meant to send to someone else but accidentally sent back to myself (stranger things have happened). I stared at the envelope turning it over and over in my hands–still nothing. I opened it to find a single card with my name printed at the top. Have fun. Don’t be scared. Dare to love again. The note was in my writing, and it was from practically two years ago. I vaguely remember how I felt when I wrote it: Small. Uncertain. Fragile. After moving to San Francisco and realizing pretty quickly that I’d be going it solo, I started doing yoga almost every day just to clear my head and, frankly, have an excuse to get out of the apartment. I remember New Years Day when everyone (including my own parents) was hung-over after too much partying the night before. The light was soft and yellow that morning and the streets were completely empty. I was up early, made a pot of coffee, sat in my little window nook overlooking the city, and decided yoga was a good way to escape all of the New Years Resolution-ness that was bound to start weighing down on the day. I strolled into class, rolled out my mat smack in the middle of the room and sat on down. We did very little yoga during that class. Instead, we did this exercise that I felt pretty uncomfortable with at first; it seemed too touchy-feely yet everyone was participating and there was no way to sneak out of the room. The teacher had these little wispy papers that deteriorated when you lit them on fire. So we wrote three things we wanted to let go of in the coming year and took turns coming up to the front of the room and burning them. I remember it all being strangely emotional–emotional in a very public way. Usually I would’ve put my guard up and excused the activity as silly, but I let myself actually take it all in and feel that day. We talked a little about our hearts. Everyone had a story. At the end of class we wrote a note to ourselves that listed three things we wanted to work on in the coming year, three bits of advice. The instructor collected them and promised she’d send them sometime in the future but wouldn’t say exactly when. So here we are, and it’s a very different kind of day, week, year, isn’t it? I hardly recognize or remember the Megan that, shakily and tearfully, wrote this note. And I keep staring at it in awe and gratitude that I’ve been so blessed with a family that encourages following your heart; friends that encourage laughter, cocktails, eating out, and ice cream cones; and, of course, Sam. So what would today’s note read? I think my advice to myself would be a little less grand in scope. I recently quit my very part-time retail job at Heath Ceramics to make more space for writing and Marge. The discount at Heath is pretty hefty and generally when people quit they make a few large purchases to round out their collection. But on my last day I looked around the shop and couldn’t think of much that I needed. I ended up buying a small bottle of good olive oil and some coffee beans. Daily pleasures I’ll use often–nothing grand, nothing showy, nothing that takes up much space. Because my life is so full on this Saturday in late September. This weekend I’m traveling up to see Sam for almost a week. When you have been counting down the days and hours until you’re back in each others’ arms, cookies are a darn fine distraction. And not just any cookies, but wonderfully chewy ginger cookies that are soft on the inside yet slightly crackled on top. They’re nothing like light, crisp gingersnaps; they’ve got a little more heft. They’ll make your kitchen smell like fall in one moments time and are perfect for slicing off little bits throughout the evening if you happen to be up working at your desk late at night. But tomorrow they travel to Seattle. Where I’ll be for the longest visit yet. I’ll take some photos and bring them back to you. Maybe in the meantime, you whip up a batch of cookies. Like many good things, this cookie recipe is the result of an accident (well, really, two accidents) while I was studying at the San Francisco Baking Institute. The first time I miscalculated the amount of flour and the second time we misread the spice profile. 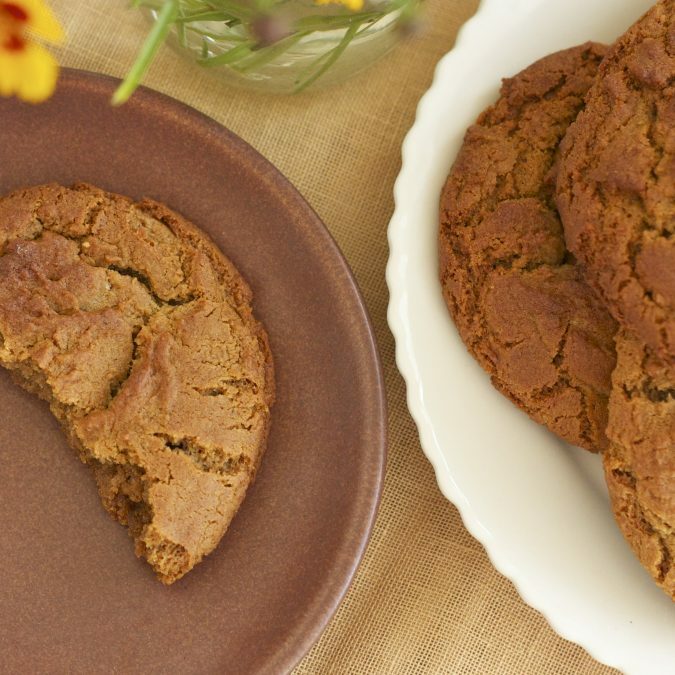 Both mistakes have given me one of my favorite fall cookie recipes of all time. Do use bread flour here instead of all-purpose flour: the higher gluten-content is integral in achieving the nice heft and chewiness that these cookies are so good for. Make a double batch; they freeze beautifully. Note: After much testing, I'll often bake these cookies with 3 1/4 cups flour. When I originally wrote the recipe, I used 3 cups flour and it yielded a flatter -- yet still delicious--cookie. I've re-written the flour measurements because I like them with a little more heft. In the bowl of a stand-mixer or in a separate bowl using electric beaters, cream the butter and sugar until well combined, about one minutes. Then add the egg and molasses and mix until just combined, 20-30 seconds. Add all of the dry ingredients and mix until just incorporated (don’t overmix here). Using a large tablespoon or ice cream scoop (see note) portion out roughly 2 ounce balls and place on a parchment-lined cookie sheet. Bake for 12-15 minutes until the tops and edges are golden brown and slightly crackled. The very center can remain slightly soft and even just a tad jiggly. When the cookies cool, they will firm up, leaving the inside and center wonderfully soft. Note: I use a blue scoop (2 ounce, #16) for most cookies in the bakery and at home. It makes for a larger cookie. Such a lovely post. Thanks for sharing your personal story and reminding us all to let go of the things that weigh us down and pursue what ignites us! Enjoy yourself I grew up around Seattle it's a GREAT place to be in love.Met my husband there :) That was 26 years ago.Now we are living in Tokyo Japan,just the two of us getting to know and love each other again. Have fun. Thanks for the great post! wow - your post struck such a chord for me. so moving. what a great yoga instructor??? and you - you were so smart and intuitive. and i'm sorry but how did you dare to love again? i don't think i will. Oh Jacquie, you will. Like I just wrote to Amanda, it just takes time and then when you least expect it...so be open to anything that comes your way, and you'll eventually surprise yourself. I love this. That's it. Just love it. To ditto Lori - I just purely love this. I wish I could send myself a note, one that I could receive at some point down the road. I feel like I may be in a place similar to the one you were in a couple of years ago. I'm trying desperately to dare myself, but I don't think my heart is up to the challenge quite yet. What a wonderful story, thanks for sharing Megan. Amanda: Time. Then when you least expect it...honest. This is so inspiring, thanks for sharing Megan! Love this post! Hope you're not feeling fragile and little anymore Miss! How sweet to get a note from the past! How you've grown :) And yes, I agree, cookies are a must. Especially spicy ones like these. I might have to get myself some bread flour & find out the secret! Beautiful & inspiring post, thank you for sharing. Definitely been in that fragile place before, and so nice to hear how you've pulled yourself out of that! 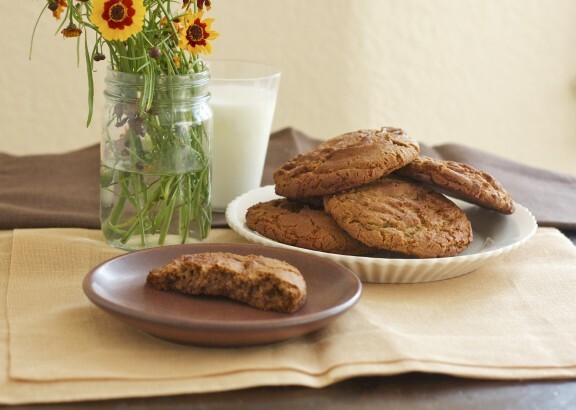 Love ginger molasses cookies, too! These look so perfect for fall. I wish we had known each other on 1/1/10. I was in a yoga class in SF too, working through similar sadness. Look at us now. Woohoo! I think about that a lot, Anne ! I remember our first coffee date when we were both wallowing a little. Seems so long ago now, eh? Love this! Inspiring, as always. Such a sweet thought. Isn't it amazing how quickly things change? What a beautiful bit of perspective. I hope you are having a great time in our fair city. Oh, I recognize that Megan because shaky or tearful, the strength was always there as was the purposefulness. Time was just the frame for those things to rise again! What a wonderful story. Sounds like you had a pretty amazing yoga instructor too - coming up with that sharing and writing exercise seems like a good way to really find peace. Loved reading this post... What a lovely surprise to get that note in the mail and have a chance to reflect on the past few years! Also, I'm really looking forward to making these cookies. Molasses is one of my favorite flavors this time of year. They look divine! I just made these and they taste great! However, they are much flatter than yours. Any idea what I did wrong? My baking soda is fresh and I tried to follow the directions exactly. They are still chewy and delicious, but not thick. Hi Megan! I have an idea: different bread flours can react differently (I use King Arthur). Try the recipe with 3 1/4 cups of flour next time. I've done them both ways, and usually 3 cups will turn out the perfect cookie but sometimes they'll end up a teeny bit on the flat side (as it sounds like yours did) if I use a different kind of bread flour, so I'll compensate by adding a little more flour. That's definitely what your cookies need from the sounds of it. So glad you tried them and liked them -- perfect for fall! So glad you enjoyed the recipe, Melissa! I bet the honey substitution was delicious. Happy weekend! What a lovely surprise to receive in the mail. I love that the instructor did that, and I am thinking it may be a good thing to do for one every year. Kind of a way to reflect. I am so behind in life ... that I have not been over here in a while. Bad. I am glad you finally ventured to give Marge more time as well that you got to spend a week in Seattle with Sam. Once we are settled in our new lives, you will have to come over for dinner. We'd love it! Wow. Incredible. Time has a mysterious way of bringing things back into our lives just when we're ready with fresh eyes and a renewed spirit. Happy for you. I have a favorite ginger cookie at a restaurant in Minneapolis, bu they will not share the recipe! This one looks like it might be close and I can't wait to try them! Claudia: I'm so, so glad to hear it. Yes I adore this cookie recipe -- such a winner. Happy future baking! Thanks for the great recipe. I used dark brown sugar and put candied ginger pieces on top of each cookie right before baking. Both made a delicious recipe even better! Oh fantastic! I'm so glad you enjoyed the recipe and I love the idea of your adaptations.